The 2018 nominees were Raina Telgemeier, Gene Luen Yang, Adam Freeman, and DC Comics Retail Support Team. For more information, visit our Industry Appreciation Award Archive. The 2013 nominees were Scott Dunbier, David Gabriel, Bill Schanes, Eric Stephenson. The 2013 memorial nominees were Julius Schwartz, Shel Dorf, and Joe Kubert. The 2012 ComicsPRO Industry Appreciation Award winner is Bob Wayne, the Memorial Award winner is Phil Seuling. The 2012 nominees were Cindy Fournier, David Gabriel, Robert Kirkman, Eric Stephenson, and Bob Wayne. The 2012 memorial nominees were Julius Schwartz and Phil Seuling. The 2011 ComicsPRO Industry Appreciation Award winner is Stan Lee, the Memorial Award winner is Jack Kirby. The 2011 nominees were Steve Geppi, Denis Kitchen, Stan Lee, Bill Schanes and Bob Wayne. The 2011 memorial nominees were Will Eisner, Jack Kirby, Julius Schwartz and Phil Seuling. 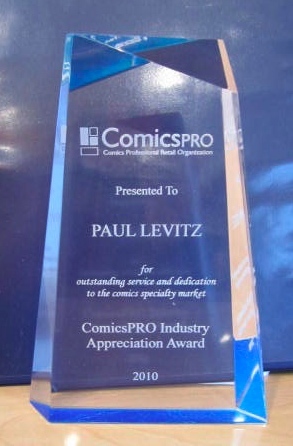 The 2010 ComicsPRO Industry Appreciation Award winner is Paul Levitz, the Memorial Award winner is Carol Kalish. The 2010 nominees were Neil Gaiman, Steve Geppi, Paul Levitz, Dave Sim and Bob Wayne. The 2010 memorial nominees were Will Eisner, Carol Kalish, Julius Schwartz and Phil Seuling.